Instant AFM and nanoprobe instrumentation - just add science! View our AFM Video Tutorial. MadPLL® is a powerful instrument package that allows the user to create an inexpensive, high resolution resonant scan probe microscope using Mad City Labs piezo nanopositioning systems. In short, MadPLL® can be used to create an “instant” closed loop AFM or NSOM at a fraction of the cost of other commercial systems. Applications include the study of Nitrogen vacancies in diamond and optical antennae. MadPLL® has been specifically designed for resonant probes such as tuning forks and Akiyama probes. MadPLL® is fully compatible with Mad City Labs’ high resolution piezo nanopositioning systems, giving users seamless integration of hardware and software with flexibility and performance not available in commercial scanning probe microscopes. MadPLL® is an integrated solution that includes the digital phase lock loop (PLL) controller, software, sensor amplifier, probe board mount, and resonant probe mounting board. Simply add your Akiyama probe or tuning fork to the probe board to create a powerful force sensor for scanning probe measurements with no optics required. The MadPLL® package includes the MadPLL® digital PLL controller, sensor board, probe board, and MadPLL® software. Ease of integration with resonant probes and Mad City Labs' low noise piezo nanopositioning systems give users the ability to create high performance, low cost NSOM and AFM instruments. The PLL controller contains a digitally controlled proportional integral (PI) loop designed to work seamlessly with Mad City Labs’ piezo nanopositioning systems. The addition of closed loop piezo nanopositioners adds to the high performance of MadPLL®. Additional options are available for multi-axis closed loop piezo nanopositioner control. The PLL controller has three operational modes: self oscillation, PLL driven, and lock-in/DDS driven. The probe can be controlled in constant excitation or constant signal mode. 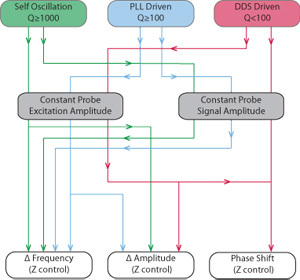 Measured outputs from the controller include changes in frequency, amplitude or phase shift. The digital MadPLL® controller has three operational modes: self oscillation, PLL driven, and DDS driven. The probe can be controlled in constant excitation amplitude or constant signal amplitude. Changes in frequency, amplitude, or phase are measured for Z control. 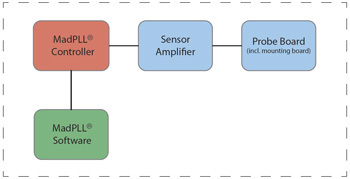 The sensor amplifier is the interface between the MadPLL® controller and the probe. The sensor amplifier contains a preamplifier, an excitation signal attenuator, and a parasistic capacitance compensation (PCC) circuit. The probe board mount and probe board assemblies are compact and can be fitted to existing instrumentation. The probe board simply plugs into the probe board mount. The mount can be fixed to a precision positioner such as a closed loop piezo nanopositioning system. The probe board has been designed for use with tuning forks and Akiyama probes. These probes are easy to mount and alignment free. MadPLL® includes a sensor amplifier, probe boards, and intermediate probe mount. The probe boards are designed for use with tuning forks, Akiyama probes and Accutune probes. MadPLL® software simplifies the control of your scanning probe microscope. All of the functions of MadPLL® are fully automated but accessible via individual software control. Among the software features are automated setup, configuration control, auto-Q calculation and automatic parasitic capacitance compensation (PCC) control. These included features are designed to simplify setup and accelerate the data acquisition process. MadPLL® software integrates seamlessly with Mad City Labs' AFMView™ software. AFMView™ software is part of our complete SPM development system. Instant AFM - just add science! MadPLL® is the foundation of a customized, high resolution atomic force microscope (AFM) at a fraction of the cost of commercial systems. MadPLL® seamless integration with Mad City Labs’ low noise single and multi-axis piezo nanopositioning systems makes it possible to create a fully closed loop AFM. The AFM described is suitable for both research and teaching environments and can be further customized for vacuum operation. This configuration is a highly flexible, low cost, multi-axis, closed loop Akiyama or tuning fork AFM called the SPM-M Kit. All Mad City Labs piezo nanopositioning systems have low noise PicoQ® sensor technology and closed loop feedback control. With MadPLL® the user can create a high performance scanning probe instrument at reduced cost. * All Mad City Labs nanopositioning systems include the Nano-Drive® controller which is fully LabVIEW/C++/MATLAB compatible. AFM configurations typically achieve Z resolutions of 0.5nm (rms) and a scanning frequency of 1Hz. Atomic step resolution and higher scan speeds can be achieved using da wide selection of Mad City Labs piezo nanopositioning systems designed for metrology and high resolution microscopy applications. All Mad City Labs piezo nanopositioning systems have low noise PicoQ® sensor technology and closed loop feedback control. The images below were acquired using MadPLL® with Mad City Labs closed loop nanopositioning systems. Data taken using MadPLL® with Nano-HS3 3-axis piezo nanopositioning system and etched tungsten tip on a quartz tuning fork. Data taken using MadPLL® with Nano-HS3 3-axis piezo nanopositioning system and Akiyama probe. Data taken using MadPLL® with Nano-OP30 piezo nanopositioning system (Z-axis), Nano-OP100 nanopositioning system (XY axes) and Akiyama probe.